I'm a huge Brad Miller fan. I'm as high on Brad Miller for 2014 (and beyond) as I was on Carlos Gomez for 2013. I have snatched up Miller in all my fantasy baseball leagues. Earlier this offseason, I argued that the Reds should trade for him. And, now, he's one of my 2014 breakout candidates. Suffice it to say, I'm all in on Miller for 2014 and beyond. I just struggle to find things to not like about Miller. He's a very well-rounded player with a strong collegiate pedigree earned at the University of Clemson. Miller has tools, skills, and intangibles and I really can't fathom why he isn't more highly regarded in scouting and pundit circles (with the exception of John Sickels, who seemed to be both earlier and higher on Miller). Those circles seem to have him pegged as something less than an impact talent, which is where I have him pegged. Miller has the ability to control the strike zone, hit for average, and hit for solid power. He also has strong intangibles and leadership skills, as evidenced by his amateur travel team coach Chet Lemon calling him "a coach's dream". He hits without batting gloves and he wears old school stirrups. Everything he does just seems to work. As for mechanics, I really love his swing, which generates a lot of leverage. In the above photo, which I love, there's really a lot to like. He has his back elbow in tight to his back hip, which increases his rotational speed and gives him a more direct hand path to the point of impact. His hip rotation is powerful and drives his weight up on to the toe of his back foot. And, finally, I love the angle of the bat in relation to his left forearm. His hips have already fired, but he hasn't yet released the barrel of the bat, which gives him strong rotational power and allows him to whip the bat through the strike zone with very good speed and force. He has a short, compact swing to the point of impact, but still gets very good extension out-and-through the pitch. Despite not being the biggest guy on the block, his swing generates very good leverage and power. In addition to strong swing mechanics that generate substantial force, Miller also has good pitch recognition and hand-eye coordination skills, which enable him to identify pitches he can drive and consistently get the barrel of the bat on the pitch. His hands work very well in the swing. Overall, his combination of skills allows him to drive the ball to all fields. In the field and on the bases, Miller has a long and lean type of athleticism. He's not the fastest guy on the field, but he runs up on the balls of feet with the exuberance of a young gazelle. In the field, he has smooth fielding actions and soft hands. His range is solid/average and he has good arm strength, but has battled inconsistency in his accuracy, perhaps due in part to his non-traditional arm stroke. He should have more than enough ability to be a league-average defensive shortstop with room to grow into something more. Miller is a unique talent and one I really wish was on the Reds. One interesting note about his 2013 season was that Miller hit 2 homers in a game three separate times. Maybe that doesn't mean anything more than his production was clustered over fewer games than expected. Or, maybe it means that his bat is more explosive than commonly thought. I have high hopes for Brad Miller in 2014 and beyond and there isn't much he could do that would surprise me. I could see a 15/15 season. I could see 20+ homers. I could see a .285+ batting average. I think the offensive upside is higher than the general consensus and he's certainly ripping the cover off the ball in spring training, which could carry over into the early part of the 2014 season. Overall, I'm very bullish on Brad Miller for 2014 and beyond. I like pretty much everything he does on the baseball field, as well as the manner in which he does it. All that said, I'm pretty much all in on Miller and I'm expecting a breakout season in 2014. Well, Brad Miller's season didn't resemble a breakout quite so much as it did a dumpster fire. It wasn't pretty, but there might yet be a silver lining. Things started out well for Miller. Mariner manager Lloyd McClendon held off naming a starting shortstop until well into spring training, forcing Miller and Franklin to “compete” for the job. Whether that was truly a competition or not, Miller certainly earned the job. He was one of the hottest hitters in all of spring training, crushing the ball all over the yard to the tune of .410/.478/.838/1.314. Spring training statistics mean basically nothing, but there have been studies that say if there is any correlation between spring training performance and performance during the subsequent regular season, then exists in those hitters who have massive spring training numbers. Basically, if a hitter is crushing the ball at a ridiculous clip, then there might be a small step up in regular season performance level in the offing. So, things started well for Miller, but unraveled quickly. Miller started slowly and pressed heavily when his struggles began to mount. It might have been a fairly typical sophomore slump, driven by adjustments made by pitchers and the hitter struggling to adjust back. In Miller's case, pitchers were frequently pitching him backward, breaking balls early and fastballs late. Miller's struggles caused him to expand his zone, swing earlier, and chase often. That more aggressive approach would send him careening down the rabbit hole from which he would struggle to escape. Miller is a bit more pull oriented than I realized. That’s certainly not fatal, as he has some serious power to the pull-side and most major league hitters are pull-oriented these days. It’s not that he won’t go the other way often, it’s more that when he does it seems more like a slice/filet type swing to serve the ball the other way, rather than hitting the inside of the ball to drive it the other way. So, he would probably benefit from driving the ball to the opposite field more often. But, I think he can find plenty of success with a pull approach and it’s not heavy enough to bring about a defensive-shift problem. To me, the problem stems much more from losing control of the strikezone. In 2013, Miller swung at 49.4% of all pitches, but that number was down to 47.5% in 2014. In a vacuum, you’d think that meant he got a bit more selective. However, the percentage of pitches he swings at outside of the zone increased from 31.2% in 2013 to 33.2% in 2014 , while the percentage of pitches he swung at inside the zone decreased from 66.8% in 2013 to 62.4% in 2014. So, he swung less often overall, but chased pitches outside of the zone more often and swung less often at pitches inside the zone. Compounding the problem, he actually made contact at a greater rate on pitches outside of the strikezone (65.0% in 2013 -> 66.7% in 2014) and at a lesser rate on pitches inside the strikezone (90.7% in 2013 -> 86.3% in 2014). In short, he swung more often and made more contact on pitches outside the zone, swung less often and made less contact on pitches inside the zone. Obviously, he let the pitcher dictate the terms of the AB more than he did in 2013. Those numbers were all trending in the wrong direction and need to be rectified going forward. I do wish, however, that those plate discipline stats were more readily available in monthly splits, as I feel like Miller was better late in the season. I watched a handful of Mariner games late in the season with a particular focus on Miller's approach at the plate. In those games, I really didn’t see Miller make a single poor decision on a pitch. His approach was good. He laid off breaking pitches early in the ABs, seemed to take advantage of count-leverage by looking for the fastball in hitter counts, protected the zone when he was behind in the count, and rarely seemed to chase pitches out of the zone. Now, the results of those ABs weren’t always all that could be wished, but the approach was good. A good process is more likely to yield good results. Eno Sarris of FanGraphs also found an improved approach in Miller, noting in his podcast of September 9th that Miller had started laying off pitches up-and-in, a particularly troublesome spot for all hitters, in the second half of the season. Miller laid off two sliders that he might have chased earlier in the season, each of which increased his count-leverage. Each time he worked the count more in his favor, he waited for and ambushed the fastball. Once again, his plate approach seems improved. Previously, a lefty spinning breaking balls low-and-away might have eaten his lunch. Here, he used a strong approach to work the count in his favor and brought about a consequence to the AB on his terms. He worked to get the pitch that he wanted. Overall, despite some very low moments, I think Brad Miller can recover from his 2014 struggles. Early in the season, the game sped-up on him, getting faster and faster as his struggles grew, but he managed to slow it back down a bit later in the season. It's entirely possible that 2014 was a necessary growing pain for Miller, as he hadn't struggled at the plate at any level in his entire time in professional baseball. If he can learn from it, the 2014 season might prove to be nothing more than a painful, but ultimately necessary, opportunity to both identify and correct a flawed plate approach. Earlier in the season, the game sped-up on him, getting faster and faster as his struggles grew, but he was able to slow it back down later in the season. For hitters, slowing things down at the plate is a huge key to success. If Miller can continue to sort out his plate approach problems, then his good swing mechanics and strong feel for hitting should take care of the rest. 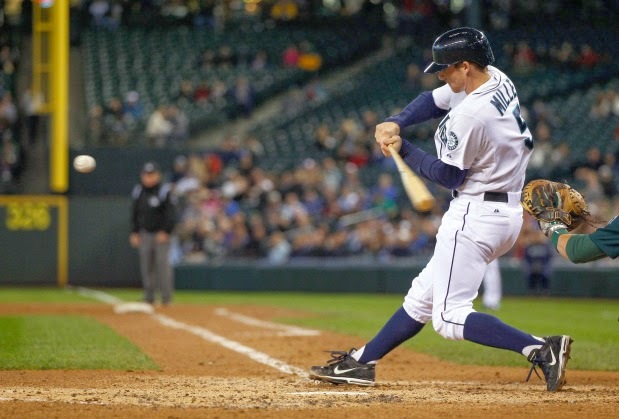 If I was a GM, then Brad Miller would be the top “buy-low” candidate on my list for 2015. There’s still a tremendous amount of potential there and his plate approach gains could unlock it. Ultimately, I don’t think I was wrong in expecting a breakout season from Miller, but I do think I was early. Going into 2015 and beyond, I would double-down on my bet on Brad Miller. Love Brad Miller as much as you do brother...he does it all. Wish he was a Met. Yeah, I think he could be a very, very good player. I've been really surprised to see new Mariner manager Lloyd McClendon continue to assert that the shortstop position is still an open competition between Miller and Nick Franklin. And, even more surprised to hear rumblings that the Mariners would look to trade EITHER Franklin OR Miller. I'm not sure whether the shortstop "competition" is mere fiction designed to drive up Nick Franklin's trade value, but the longer it continues the less likely that seems. Add in the rumblings that Miller is/was available this offseason and I would have jumped at the chance to acquire him if I were the Mets....or any other team. Grab him before the Mariners wake up and realize what they have. The Mets have been reportedly trying to trade for Nick Franklin all offseason, but to me Miller is the much more appealing target and the one on whom they should have been focused. Anyway, thanks for the comment and good luck to your Mets this year!